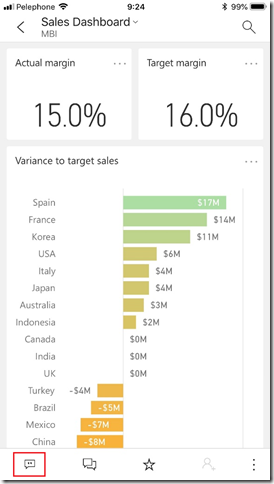 At Power BI, we help you tell your story. Our platform of powerful tools empowers our users to analyze and derive insights from their data while creating stunning visuals to share that story. Analysis doesn’t stop when you publish your reports or dashboards – the conversation continues in meetings, over email, and during casual chats – so we’re bringing the conversation to you, and creating a collaboration tool within Power BI that encourages further discussion. 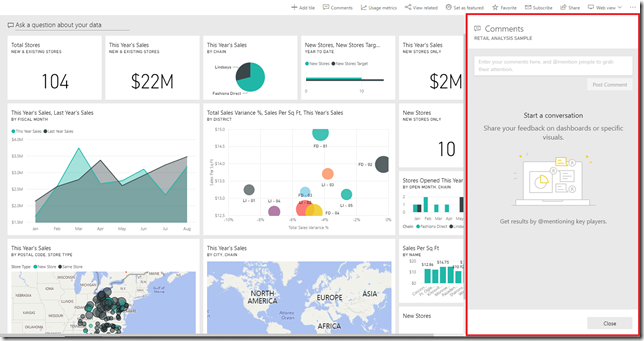 Today I’m thrilled to announce the general availability of dashboard comments in Power BI service and mobile. 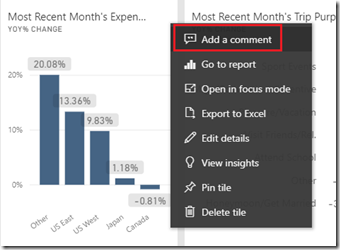 Now you can directly add comments to dashboards and specific visuals to discuss your data. You don’t need to rely on your favorite screenshotting tool and email client to start a conversation; comments allow you to do all that in the same view! You can also pull people into your conversation by @mentioning others within your organization. Commenting is tightly integrated with mobile, so those you’ve @mentioned will quickly receive a notification and email with your message. Excited? Read on for a walkthrough on using comments. Or, head on over to your favorite dashboard, and start a conversation! To get started, navigate to any dashboard you have view or edit permissions to. From there, select the new Comments button in the top bar. In the Comments pane that appears, you will see a quick tutorial that walks you through all the capabilities (once and first time only). After dismissing the tutorial, if there are existing comments for that dashboard, they will appear immediately in the pane. You can add your reply to an ongoing conversation or start one yourself. Tip: If you can’t open the Comments pane, hover over the button and check if the author has disabled this feature for that dashboard. The same thing applies on the mobile app. When you open a dashboard, you will notice the comment icon in the bottom action bar. This icon allows you to open the Comments pane. If the icon on the mobile app has a dot, it indicates that the dashboard already has at least one comment thread. Dashboard-level – A comment that generally pertains to the entire dashboard and doesn’t bring attention to any individual visuals. 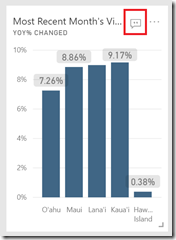 Visual-level – A comment that is tied to a single visual (i.e. tile) on a dashboard. When you open the Comments pane on a dashboard from the top bar, you will see both dashboard-level and visual-level comments as shown in the Hawaii Tourism pane example. You will also notice that comments are sorted in reverse chronological order, with the newest comment first and the oldest comment last. The way you distinguish between the two levels of comments is through presence of the visual icon below the author’s image. Any comment that has this icon is known to be on a visual level (i.e. 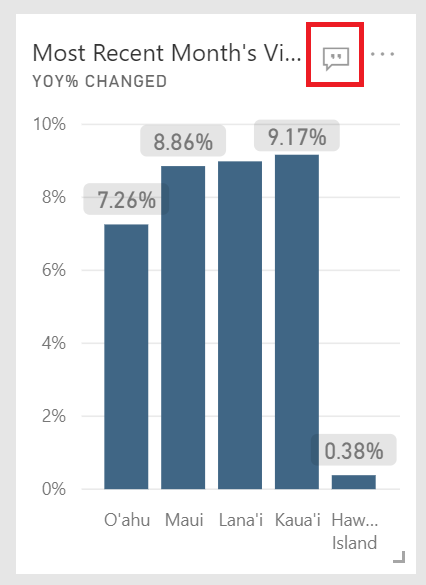 the author is specifically referring to a visual on the dashboard when making the comment). Clicking on the visual icon spotlights the tile the author was referring to. Pretty cool, right? Well, if you want to add your own comment on specific visual, you can do so from the tile options menu. Clicking on the ellipses on a tile will present you with an Add a comment option. Selecting this automatically ties your comment to that visual. In addition, as soon as a comment is posted on any tile, you will notice a tiny comment icon beside the title. 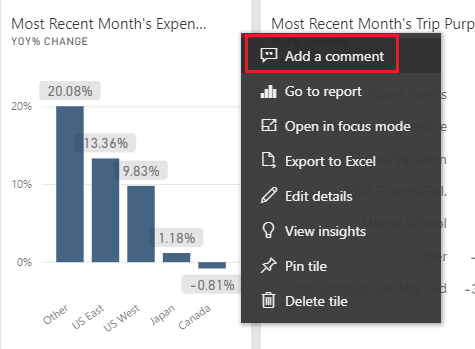 This is another entry point to open the comments pane, and it will automatically filter all the comments on the dashboard to show the ones that are associated with this tile. Note: You cannot dismiss the comment icon from your dashboard tiles. At any point, you can return to all the comments on the dashboard by hitting the All comments button on the top left of the pane. Lastly, collaboration is always about teamwork. 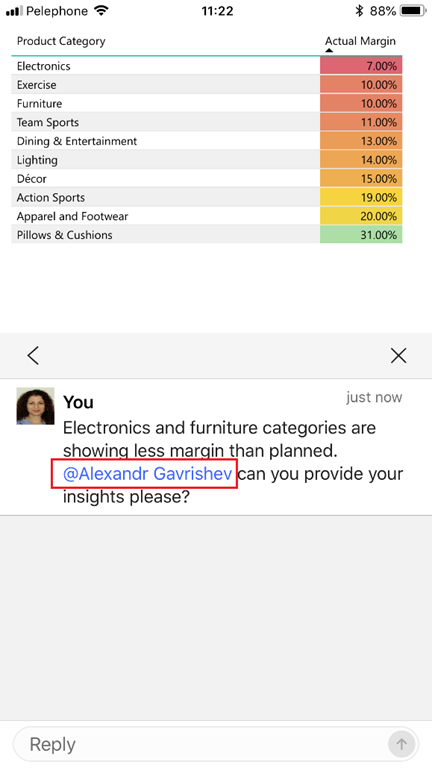 If you start a discussion on a dashboard and want someone else to know about it, you can @mention individuals within your organization in a comment to grab their attention. 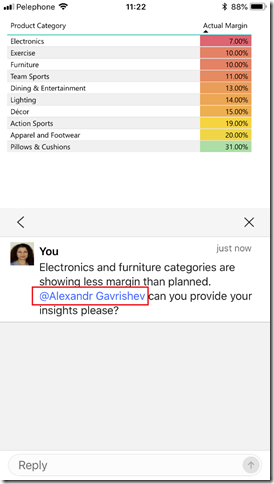 The @mentioned individuals will immediately receive an e-mail in their inbox, and if they are using a Power BI Mobile app, they will receive a push notification on their device alerting of the conversation. They can open the comment directly from the notification, view the data, and reply.